Shakespeare kneels at Viola's feet. Photo by Nile Hawver/Nile Scott Shots. Shakespeare with writer’s block? That’s the idea behind Shakespeare In Love, which just wrapped its run at Boston’s SpeakEasy Stage. Director Scott Edmiston looked back on the production, which played to sold out houses during its month on stage. Michael: What did audiences find at Shakespeare In Love? Scott: Like Shakespeare, Shakespeare In Love is designed to give you a little bit of everything. You get a little bit of comedy. You get a little bit of tragedy. You get a little bit of music. It’s a full entertainment experience. Michael: It’s got to be challenging to do a play that people … I’m imagining there’s certain expectations that people bring in to how the production should be, or how it translates. Is that accurate? Scott: Yes, that can be a challenge. Frankly, I thought a little bit less with this than when I do a classic like Who’s Afraid of Virginia Woolf or Cat On a Hot Tin Roof, because sometimes the film versions of those have become so iconic. Or people may have seen multiple stage versions of it over the years. So with Shakespeare in Love, you really just have one frame of reference, which is the film that was released 20 years ago. So I found that even for myself, there were a lot of things I didn’t remember about it. Of course, the tone of the piece, and even the structure of the play is quite different. I was very attuned to, “Well how can I assure that this is a meaningful theater experience, and that we’re giving an audience something more than they would get if they just called it up from On Demand, right, and watched the film?” We were all really cognizant of that going into the process. Michael: How do you compress a movie, which has such broad sweep, into the relatively narrow confines of the stage? Scott: Well, it does have a lot of sweep to it. It has about 20-some scenes, and original music, and dances, and fight scenes, and a dog, and dialect. But you know who did it first? Shakespeare! When you study Shakespeare’s plays, they have an enormous amount of sweet to them. 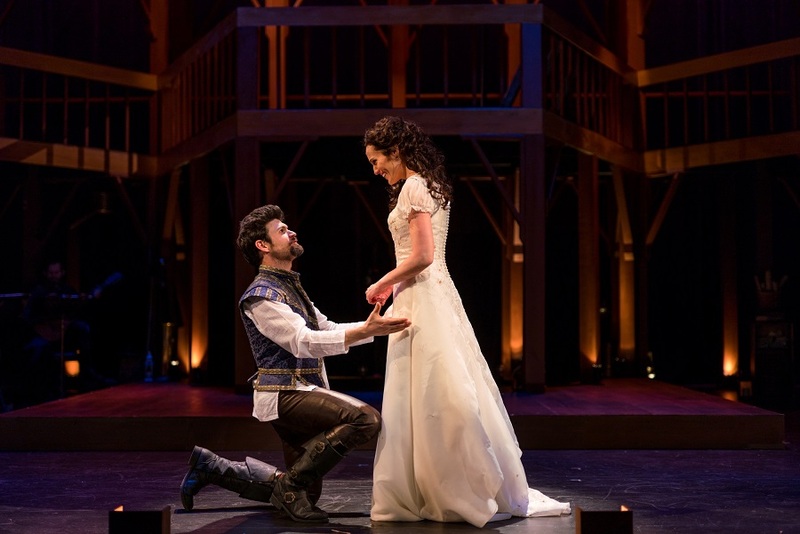 They cover an enormous amount of time, and various locations, and have songs, and dances, and fencing, and all those things that this play has. In a way, it was kind of … We’re following a great tradition there. But actually, originally, it was Shakespeare. Michael: Is it scary to do anything with Shakespeare? Do you feel as though you have a responsibility to the ages, that you might not have with something that is yours? Scott: That was one of the gifts about this play. It gave me a sense of Shakespeare, if we want to believe the mythology around this, that there really was just one man who wrote all of those plays. The sense of him as just a workingman in the theater, not just this abstract mythic genius, right, who somehow came up with all these things. He’s not just a brand. Shakespeare means so much to so many people. That word, that name, evokes so much. In this, they call him Will primarily. He’s just a 20-something guy, who’s trying to write a good play, and trying to make a life for himself in the theater. So I feel like it humanized him for me, and I think for the acting company as well, in a way that we found really relatable. I developed a new affection for him. It doesn’t just have to be reverence, right? Scott: He’s a guy in a leather jacket, trying to just come up with a really good play, and doubting himself, and worrying about it, and struggling with it. Having good days and bad days, all those things. Michael: When you think about Shakespeare, you think about a guy who had a bad day. Scott: Right, and we dispel that sense right away. The play opens with him trying to write the sonnet, “Shall I compare the to a summer’s day?” He can’t come up with a phrase for it, “Shall I compare thee to,” and he can’t figure out, “How do I end that? Shall I compare the to a mummers’ play? Autumn, springtime? He’s just working. He’s trying to figure it out. He’s trying to find his voice, and his calling, what he’s meant to do. There’s something kind of universal about that. I mean, we all go through that to some degree, thinking, “Well, what’s my gift? Where is my calling? What is my purpose here? What is my best purpose on this earth? He’s trying to find it, and I think we all go through that. Michael: What attracted you to doing Shakespeare In Love as a stage play? Scott: I have a very romantic notion of the theater. There’s something about the culture of the theater that I find quite beautiful. I think in part, because it’s evanescent, it does not last. There’s something kind of glorious about it, that it lives only in the memory and in the heart after a production is over. It’s a shared moment of time. There’s something about the community of theater people. Many of us are outsiders, and many of us are misfits, who find a sense of unity with one another, and a sense of community with one another, and find joy in connecting with each other in the creation of a work of art. This play really captures a lot of that. Michael: The play focuses on Romeo and Juliet, which is about as familiar of a play as there is in the English language. Scott: Yes. The Elizabethans loved language, and had a greater capacity for hearing complex sentences, and poetry, and ideas in words. We, in the 21st century, have a really heightened visual sensibility, I think in part because of the Internet. We can process things very quickly, visually, but we have a harder time listening to complex ideas, and complex sentence structures and language. So you kind of have to love the groundlings who attend the Shakespeare Theater, and how they loved words. How they delighted in those really complex images, and metaphors, and all the wonderful qualities that are in his writing.